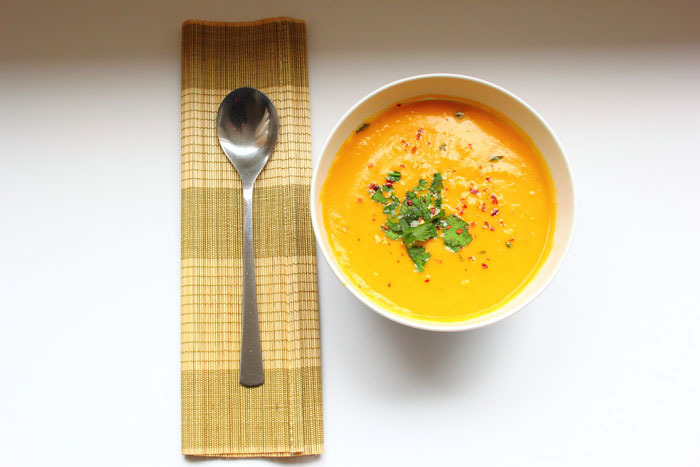 Sweet Potato & Coconut Soup – Flogging Delicious! We just love how versatile sweet potatoes can be and it’s great to see that they’ve become so popular as a healthier alternative to the regular spud. Whether they’re fried, baked, mashed, made into puddings or soups, they’re just delicious. This week we’ve used them in a soup with lots of lovely coconut milk, which adds to the velvety, sweet texture. It’s so easy to make and hassle free, and you’ll be pleased to see that it doesn’t break the bank as it requires so few ingredients! 1. Heat the olive oil in a heavy-set pot and lightly fry the onions until they start to soften, then bung in the garlic and the potatoes and continue frying for about two minutes. 3. Add in your stock and bring to the boil, then leave on medium heat on a rolling boil until the potatoes are nice and soft – they need a good 20 minutes. 4. Take the pot off the heat and, using a stick blender or a liquidiser, blitz the soup until it’s completely smooth (be careful, it can splash and the contents are hot). 5. Return to the hob and stir in the coconut milk and leave to simmer for a further 20 minutes to let the flavours develop, stirring occasionally. 6. Serve with some chopped coriander and the chilli flakes on top.